Post #2 for today! So SCROLL down, so you don’t miss anything. By far one of the CUTEST sets Christine from C.C. Designs has ever come up with! I know I say that a lot. I don’t know about you, but Im a sucker for Lucky and Lulu and anything with the monkey and bear. This set is no exception. It goes on sale tonight at 10pm EST. It will be available HERE, after then. You can purchase JUST the set or a Kit that uses the Cosmo Cricket Hello Sunshine patterned paper in it. 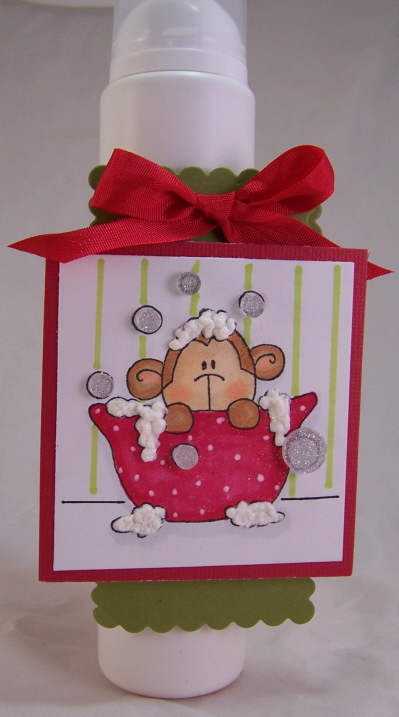 I HAD to do a gift set for this because its just WAY too adorable NOT to! 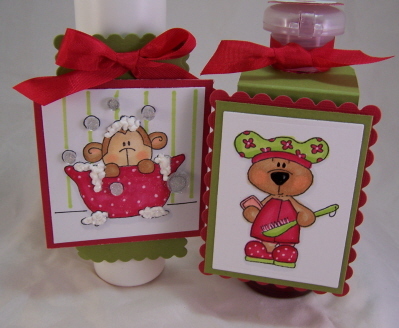 There is liquid body wash (bear), Foaming bath soap (monkey) both in a cute red bucket. 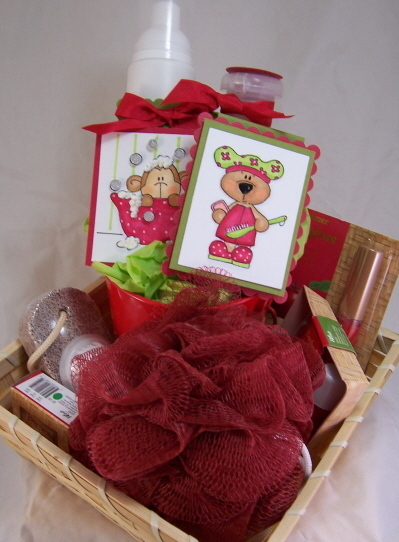 In the basket is a pumice stone/foot scrubber, some lip gloss, lip balm, loofah, more lip gloss, and body butter. Now for the close ups! How super adorable are these? I think even giving JUST one of these, dressed up for a teacher is AWESOME! 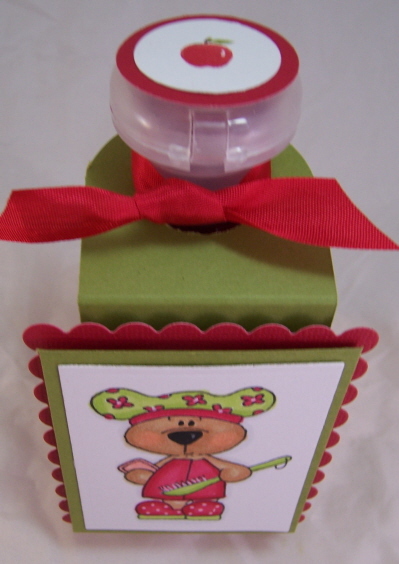 Think of the foaming apple scented hand sanitizer! PERFECT! What teacher wouldn’t love that? I LOVE making tags that hang off items so I did that here. Kept it simple since it is going to my 4 year old! This is the shower gel soap. I put an apple (from limitless labels set) to show that it is apple scented. Seriously-how cute is that? I used a ruler to create the floor and stripped “wall paper”. A super quick touch but it helped tie in my colors and get rid of the WHITE. I used my Bella Baubles for the “bubbles” in the air. Honestly that may have been too much for this particular tag, but Amber loved it. Liquid applique made my bubble bath 😀 Its actually sparkly! This tag is just stuck on with dimensionals, unlike the above gel. So that is it. This really took no time at all, and the images are super fun to color. I have to admit the bear KILLS me! I love her to pieces. SOOOOOOOOOOOOO, that being said,don’t miss out on ordering OK! Oh and she is having another release with peeks starting on the 30th. FYI! Well there you have a few more ideas for gifts, I hope. I am off and running. Tomorrow I will be participating in a Bella Blog HOP! I think this card is very pretty in pastel colors. Gives a calm feel, doesn’t it? Yet, it has the whimsical cuteness that I love, with a touch of serious heartfelt thanks. In celebration of World Alzheimer’s Day I made this card for Cammie’s AMAZING give-away 😀 Check out the details here. You can make a card to brighten a care giver’s day and enter to win 😀 Being a nurse I worked on an Alzheimer’s/Dementia unit for almost 3 years. I can say it is a very difficult job at times. One woman always thought I was her daughter. She would always spend her day with me calling me Marianne. I would attempt to redirect her, but to no avail. I must have resembled her daughter a lot, because I was the only one she would follow around, and call to. When I became pregnant with Alexa she thought it was her grandchild. She would follow me around all day. Always wanting to feel the baby move. Most of the time she was sweet. The sad part of it was, her daughter dropped her off at the home, never to return. So, sometimes she would remember this, and get suddenly outraged at me. She actually hit me a few times, out of her anger and confusion. It was so sad. It would come out of no where. She would then just cry for hours about WHY I left her there. Why wouldn’t I take her home with me? Promises of being “good”. Like a child who rationalized things. I would have to sneak off the floor to go home so she wouldn’t notice. When I would work she wouldn’t participate in activities or anything. I knew she was such a great woman, and I am sure before all this she lived a wonderful life. Maybe her daughter couldn’t bare seeing her deteriorate before her eyes? It is amazing how this disease transforms loved ones into people they themselves wouldn’t recognize. Anyway I eventually got injured by a patient and was made to leave my job the remainder of my pregnancy. I think Cammie is doing an amazing thing to honor care-givers and her grandmother’s disease. I am going to send this card in honor of her grandmother, to the facility that her grandmother resided. 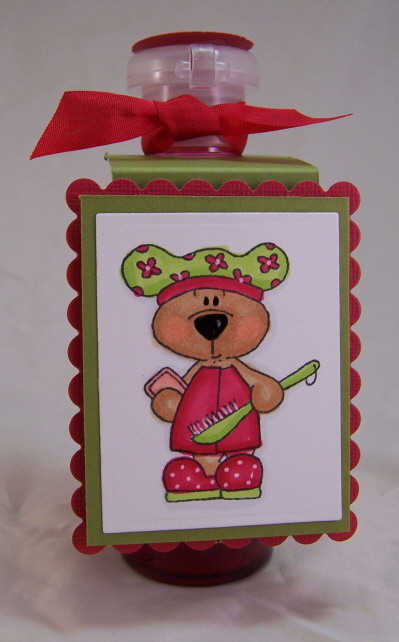 Now for the card-I LOVE In the treetop. It was one of those sets I so wanted to use MORE, but time escaped me. Then I forgot about it! So I was determined this would be the set I use for this creation. I love Sweet blush, spring moss, and SU! old olive together. 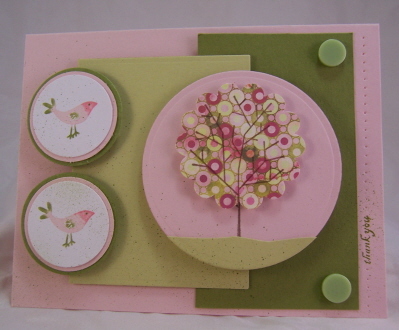 Spring Moss and Sweet blush can be found at Papertrey Ink. I wish Nichole would just release ALL her colors at once 😀 There is no better cardstock out there! I just stamped the open tree on my cardstock, then again on some GORGEOUS patterned paper-the Eva collection by Basic Grey, to punch out my tree top with. The sentiment is from Heart to Heart. I then pierced the edge along the end piece for more interest. Finished off with my color spritzer (of course! ), and will send this on its way.